Has a word ever popped into your head and your first inclination is to go around repeating it until you wear it out. Then it hits you that your fun new word might not even be a word. Somewhere between my English and Italian, words just have a way of appearing out of thin air and I'm never quite sure if they are genius or town clownish. Farcical was one of those words, it sounded real, but was I having these delusional thoughts due to lack of sleep. I was convinced the word originated when some clown on a bicycle decided to show off for a couple of cute clowns hanging out on a park bench. He was looking so fly, until he was waylaid by an attack of gas brought on by an overconsumption of broccoli from the previous evening. Gasping for air between fits of hysterical laughter one of the cute clowns said, "That's not a bicycle - it's a farcical." Just to be sure, I went ahead and Googled farcical and sure enough it was a real word and I wasn't too far off on the definition at least for someone who hasn't slept or even sat down for the last couple of weeks. There they were staring back at me from across the crowded stand. Strange purple tentacles reaching out for me. I could feel the overwhelming pressure to submit to their purpley charms. I was helpless in their presence and before I knew it they had affixed themselves to my hand with a strangling death grip. They must have sensed I would treat them with kindness and respect and therefore I was worth going home with. "I Was Robbed by a Red Dragon Fruit"
Red Dragon Fruit oh how I've longed for you Red Dragon Fruit. Maya spins your flesh into fantastical creations of red. Your beautiful exotic name contains the word red. Imagine my devastation when I cut you open and revealed your pale flesh. "I was robbed - I was robbed" kept replaying like a B movie in my head. I would have cast you aside like the leper you were had it not been for Maya saving your hide by suggesting I devour you with a sprinkle of lime juice and agave. I just had to show you a picture of this farcical event for I knew you would never believe me otherwise. As if this hasn't been a crazy enough year, my house is packed floor to ceiling again because I'm moving my oldest back up to her school Saturday and we are moving our house the following week back to where we used to live. If I had the next 3 days I could give you all the details but unfortunately I feel guilty about stealing away a half an hour to write this, typos are starting to drive me crazy (or did that already happen?) I feel even guiltier about some long overdue thank yous and besides there is always tomorrow, or at least that is what I keep telling myself to keep the fantasy afloat. Hmm. MY corn is never THAT happy to see me. Must be something in the way you SHUCK. ;) HA HA HA! Happy weekend, Gina! I'm here at Aria's, where the temp today is 105. I'll send you an e-mail soon. I think I can guess what book you've been reading lately. ;) Hope the next few days go smoothly and you are back to blogging soon. Don't feel guilty for taking time to write. You made everyone smile, so it was worth it. Thanks! I had to LOL! You are funny haha, Gina. Gina you had me laughing so hard, then I read Kathy's comment and can't stop laughing:) I'm sorry things haven't settled down for you. But it's great to see that your sense of humor is intact. Sending you big, big hugs!! You are so funny..I am imagining spending a day with you, I think my face would hurt from laughter! Great post, made my day! Hey Gina! Looks like you're having way too much fun with your veggies;-) Looking forward to seeing you and catching up, hope the move back to school went smoothly! Funny post! I've had those enhanced corn ears before. Maybe they're the ones that answer all those spammy emails? And moving is no fun! A few years ago - for many reasons, all of them very good - we ended up moving 3 times in 2 years - one of them a long distance move. Yuck. Thoroughly enjoyed the post - thanks. Hope you are doing well and that you had a wonderful 4th! Gina, glad that you have all these veggies in their proper specification, and as far as the FARCICAL word goes...you totally nailed this one for what you are going through! I would find all this absurd, as well! One thing got me confused...are you really moving your "house" back to where you used to live?...the entire HOUSE?...because I've seen plenty of that around here in S. Florida, unless you're moving back to your former house, which sounds more real to me! OMG-talk about Farcical...I guess you know the answer to that! Aw Gina, I definitely know your pain- Just glad to see you posting when you can! Farcical , your so funny Gina! Love the purple shades of the asparagus. Praying for a smooth transition for all of you! I feel a kindred spirit - humor - sometimes very black humor gets me through tough times! 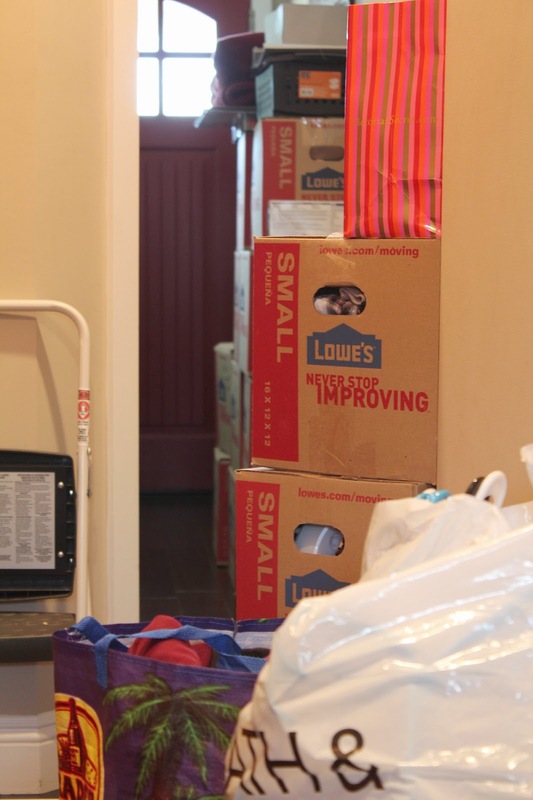 Feeling your pain with the moving - this was the summer that I would finally get my home together. And then life happens when you're busy making plans. Hoping things calm down for you - and your produce. Hi Gina--I hope your move went well! Love the pics! Thanks everyone, it's going, although a bit too slowly for my taste. Hopefully I will be up to speed soon. Sure you were shucking corn after seeing that corn toy...okay I have to stop now as this could get really bad but you asked for it, lol!